towards the +4.99mW total of 532nm. This pointer is beautiful! It looks a bit dull on the pictures but once you have it on your hand it looks great. The matte paint complements the style perfectly. I bought this product because i wanted something safe to toy around before trying higher powered lasers. I searched around for a reputable seller with high quality products and Optotronics was on the top of the list. i couldn't be happier, laser has been working for a while and it's overspec just enough ;). 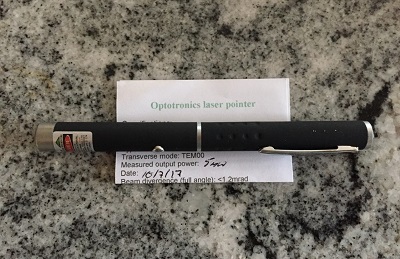 This is my first green laser pointer. It's much brighter than the old red pointer I've had for years. (I'm not certain of the power rating for that one and it runs off three A76 button cells vs. two AAA batteries for this one.) With the Optotronics pointer outside in the dark I can even see the beam somewhat. This pointer has a nice heft to it and appears very well-made. The power button has a distinct snap, and the spring feels like it should be quite durable. I'm very pleased with this product so far. This version output a quite brilliant green dot also in daylight. I often use it in office and at night it output a quite visible green beam, useful for pointing. An interesting idea for a gift.